Mission Statement: To make disciples of Jesus Christ by nurturing spiritual growth and providing avenues for service to others. 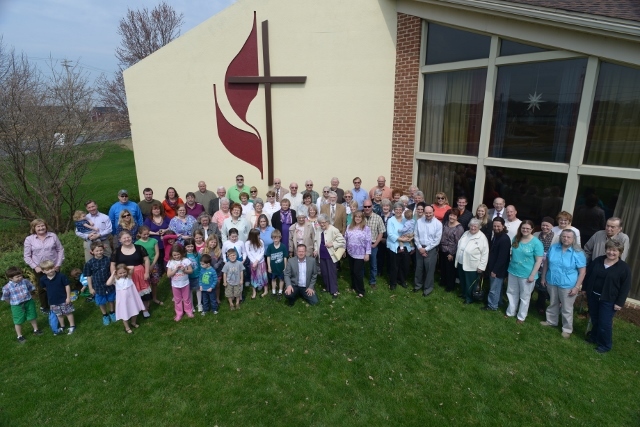 Who we are: Faith UMC is a growing mid-sized church located on the corner of Fruitville Pike and Koser Road (the entrance is off of Koser Road). Sunday Services include a blend of contemporary worship songs and traditional hymns--and engaging, practical, Bible-based sermons. There is a Children's Time message each week in the service after which kids are invited to Junior Church. We also have a new Kid's Choir who share music during this service about once a month! We are an active church with many different opportunities to get involved--fellowship events, Bible Studies for all ages, and a many ways to serve within the church and community. Faith UMC provides an intimate atmosphere where you can get to really know other people and have them care for you. If you are looking for a church that is vibrant and excited about living out their faith, then Faith UMC may be the place for you. We are inviting in experts on these subjects from local social service agencies to come in and provide this training. Mental health struggles and the opioid crisis are epidemics that are taking the lives of so many people and impacting their family and friends. In many cases the individuals who are impacted have underlying mental health struggles that fuel their addiction. We cannot keep silent about either of these topics and the lives they impact nor can we allow them to stigmatize people. We are inviting everyone to this informative session--whether you or a loved are struggling you are welcome to join us. Please mark your calendar and stay tuned for more information. Tickets will be required--although they will be FREE. We need to monitor seating and parking. If there is more interest than our facilities can handle, we will look to offer additional sessions and/or locations. Contact Pastor Jason at (717) 333-9238 if you have questions. If you are actively struggling and need help now, please call 211 for support--or 911 if it is an emergency. Lifetree Café is an outreach ministry where people who are not currently part of a church can come out and discuss a variety of issues where faith and life intersect—including hot-button issues like relationships, immigration, forgiveness, loss, etc. Life Tree Café is held at the General Sutter Inn in Lititz on Monday nights @7pm. Bring friends who are not currently engaged with a church out for dinner and a discussion. You can buy appetizers, a meal and/or drinks during the session. Visit www.lifetreecafelancaster.us for more info and video clips of all of the upcoming topics. And please like and follow us on Facebook to get weekly updates: Lifetree Cafe - Lititz. Every week AA meets at Faith UMC to support one another in recovery. It is an open group, and all who are in recovery or beginning recovery are invited to come out to the meeting at 10am each week. They are meeting in the Fellowship Hall in the Education Wing. Everyone is welcome. We meet at Faith UMC, but folks from the community and several different churches attend. Pastor Jason leads these Bible Studies. This is a chance to deeply explore your faith—and how it impacts the rest of your life. We would love to have you join us. We meet in the Fellowship Hall in the Education Wing at Faith UMC. We are just beginning a series on "Social Justice" from a Christian perspective. We will explore how to make decisions on complicated issues for ourselves and our society that are righteous and just in the eyes of God. This is not partisan. We are not attempting to define the right answer for each person. Our goal is to talk about the process of how to make those types of decisions as individuals and as groups. Led by Mike Shifflet (from Oregon Community UMC), this group meets each week to study a book of the Bible in depth. Come out for for the coffee, food, fellowship and growth in your Christian Faith. Mike Shifflet will be leading this weekly Sunday morning study. After Easter we will begin studying the Book of Romans. Youth meet every Sunday—normally at Faith UMC from 5-7 pm. We also have Sunday School at Faith UMC at 9am and at Long Memorial UMC at 9:30am. For more info about upcoming events, please check out the Youth Section of our Website. Permission Slips are needed for all off-site trips and can be downloaded from the Youth Section of our Website. RSVP (on sign up sheets at Faith UMC, by text or by calling Pastor Jason) so that we can plan accordingly for chaperones, food and vehicles. This is a new small group. Pastor Jason will guide us in discussions on a variety of philosophical and theological questions that people raise about God, faith, the meaning of life, morality, the nature of evil, etc. Come with your questions and willingness to hear and learn from the group. The next meeting will be on May 19 (to avoid Mother's Day). Everyone is welcome. Bring a friend!